It’s hard to believe the iPhone is only a decade old, when the world has changed so much. Today, I had to wait in a parking lot for a few minutes, and as I was thinking about the look of 622’s truck wheels, and how they don’t quite match the photo, I thought I’d see what I could do there and then. So, I opened the OnShape mobile app, and changed a number of dimensions until I was happy with it. Then I wrote this blog post on my phone too. It’s not the hours you can spend on this hobby, but the minutes that matter. Now there are more minutes. This entry was posted in Opinions on December 23, 2017 by Simon. Nothing is less real than realism. Details are confusing. It is only by selection, by elimination, by emphasis, that we get at the real meaning of things. This is a lot deeper than an initial reading might suggest: O’Keefe was talking about identifying the essence of something, so that it can be drawn out. She was not, necessarily, talking about eliminating every detail, but making the point that you can remove some of the distractions from what you are trying to portray, to make your creation clearer. That said, I think a degree of caution is necessary when translating Georgia O’Keefe’s words to our hobby. Our models are not static 2-d representations attempting to emulate the impact of distance on stereoscopic vision which makes judgements of size and distance based on relative angular displacement (“perspective”). We have depth as well as height and width. We actually have twice as many dimensions to play with, for we also have time, allowing movement, which in a painting may be portrayed by blurring some of the detail, and things which are far away and indistinct may come closer and resolve into exquisitely made tiny parts on a model. Say, for example, that you are building a model of an industrial steam tank engine. There would be levers for opening the sand pipes, with flat rodding and various cranks running from the cab down one side to a sandbox, with a crank and rod running across the back of the smoke box to a sandbox on the other side. For the sake of illustrating the point, this is a scratch build. How do you best represent this? In theory, you should have some rectangular strips of brass, pinned and soldered at each joint, using the head of the pin to represent a rivet or bolt. That would provide the ultimate in detail. Of course, if you were working on a 5” gauge live steam engine, it might well be assembled to work, but as you come down the scales, you get a point where the extra detail of doing it the “hard way” gets lost in shadows, so unless you are building for a competition, is it worth bothering at all? Possibly not, once you get down to Z gauge, maybe, but even in N Scale, a complete absence of the rodding may not look right. So, what you can do, is use a piece of wire to represent the rodding, cranks and joints: if you feel really adventurous, you might even squeeze parts of it flat, to improve the looks. 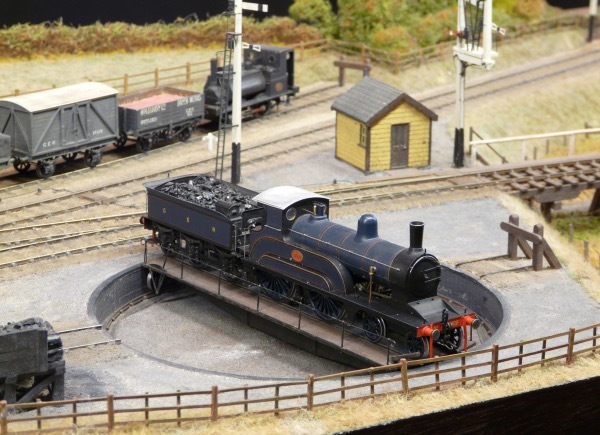 This would work well on a “layout quality”/“3 foot rule” model in most scales, including 7mm scale, but especially so for scales smaller than this (I know, ‘cos this is what a friend has done). But – and this is the crucial point – it still needs to be bent in the right places, and in the correct direction. You don’t simply take any old piece of wire and a pair of cheap pliers and 30 seconds later say, et voila! No, you take care to select a piece of wire that is noticeable but not obvious and decent pair of pliers, and measure and bend carefully. Say 5 minutes. Still easier and less time consuming than doing it all with separate pieces, and far better than leaving it out. I was comparing two recent 16T mineral builds with an earlier example that I put together. The latter has etched ‘V’ hangers, brake lever, ratchet and safety links, whereas the new builds have just had the kit parts refined, and a wire brake cross shaft fitted. Can I tell the difference on the layout, can I heck, which begs the question is it worth going the extra mile in 4mm scale? My take on the O’Keefe reference is not that you simply omit features, but you decide on how you are going to represent the features – in this respect, I am put in mind of what Allen McClelland unfortunately called “good enough”. I say “unfortunately” as the phrase is ambiguous and could be interpreted as settling for second best, when really it’s about asking what level of detail is required to suit your purposes. If you are operations-focused, then moulded on details will be more robust, yet will still catch the light. You will also need more stock, and the cost- and time- saving features of freight cars with moulded-on (or factory applied) details are not only substantial but essential. If you are details-focused, where close-up viewing of your models is the order of the day, then moulded on details are definitely not of interest. As René pointed out, “Marty is right: don’t sweat the details, unless that’s your thing, in which case, don’t expect anyone else to notice.” I would add that if you don’t sweat the details, hope nobody else will notice! But whatever your choice, you still make a neat and clean job of it: craftsmanship and workmanship are always necessary. This entry was posted in Opinions on December 20, 2017 by Simon. This entry was posted in Opinions on December 13, 2017 by Simon. Mike Cougill has posed a very interesting question: how best to present ourselves to serious journalists? I think the starting point would be to embrace the sheer range of interests and abilities encompassed by this most democratic of hobbies, from the 2 year old pushing a wooden train around the floor, to the determined retiree recreating yesteryear from scratch in his annex, from members of royalty right through to the poorest using the simplest of raw materials and tools to craft buildings from scrap paper and card, so that when he has a bit more money and can afford to buy some trains or more tools, he has a setting for his railway. And then some honesty. Yes, there are those who just play trains with a train set, and if that helps them relax, to get away from the stresses and strains of everyday life, then so what? But there are also those, like Gordon Gravett and Trevor Nunn as two personal examples, who build it all with the minimum of ready-made components and then – and here’s the best bit – they share the results of their endeavours at public shows, and their techniques via the model press and to anybody who asks. The rest of us fall somewhere between these extremes – both of these gentlemen have created artwork for photo-etching, and patterns for casting, so even when they use such components, they at least are building from scratch. When it comes to building models of locomotives, Trevor buys in the motor and the gears, and that’s it. When asked why, I simply say that ultimately I don’t know, but I like trains and building models provides an outlet for my creative side which is completely different from, and free from the demands of, using my brain and computers when working for a living. Related to this, my brother brought to my attention a LinkedIn* posting by Guy Kawasaki, “How never to fail“. The crux of this was that there are two outcomes to ventures, which most classify as “success” and “failure”. Guy suggests that there is success, and an opportunity to learn, “the opposite of success is not failure, it’s learning”. Well, excuse me but this is hardly news! Any good railway modeller got to be good by having a go at new techniques and learning from mistakes, by treating success and failure as the imposters Kipling so described. Who would not want to employ someone like that? And that really is worth presenting to the world. *If you are unaware of LinkedIn, it has been described to me as “like FaceBook for grownups”. This entry was posted in Opinions on July 12, 2017 by Simon. The Confederation – only possible because of railways – is 150 today, July 1st 2017. Best wishes to all those polite, self-effacing North Americans! This entry was posted in Opinions on July 1, 2017 by Simon.